Made in Italy - Mold extra star ravioli / biscuits cm. 6.5 Round pasta cut scalloped brass ravioli. Technical characteristics: size and seal the dough for your ravioli, with an old suspension mechanism inside the mold. Measurements: diameter 6.5 cm. Weight: 300 g.
Made in Italy - Mold extra star ravioli / biscuits cm. 9 Round pasta cut scalloped brass ravioli. Technical characteristics: size and seal the dough for your ravioli, with an old suspension mechanism inside the mold. Measurements: diameter 9 cm. Weight: 400 g.
The nippers Classic series are stainless steel products with a high content of carbon. - Size of Cut: 20 mm. 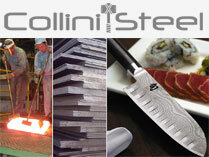 To ensure a perfect cut, Collini Cutlery with his lab sharpening internal controls and audits every instrument sold. Städter - 5 pieces set for carving fruits and vegetables Set 5 molds horse-shaped carving steel, duck, lobster, seagull and flowers are ideal for presenting fruits and vegetables, or what the imagination suggests so definitely creative. Birkmann - Historica- Stampi per gli Gugelhupf storici in silicone puro. Per cuocere in forno e congelare. Materiale antiadernte flessibile per una facile estrazione dallo stampo. Resistente al calore e al freddo da 240°C a - 60° C.
Con ricette facili a riuscita sicura. Lavabile in lavastoviglie. Da Wikipedia: Gugelhupf o Kugelhupf è un termine usato nella Germania Meridionale, in Austria, in Svizzera, in Tirolo e in Alsazia per indicare un tipo di torta. In genere ha la forma di un toroide, come una ciambella. Analogamente al dolce Ebreo kugel, la parola “gugelhupf” deriva dal termine Alto tedesco medio “Kugel”, che significa palla o globo. Un tipo comune di Gugelhupf consiste in un soffice impasto lievitato che contiene uvetta, mandorle e brandy di ciliegia Kirschwasser; alcune varianti contengono frutta candita e noci. Viene cotto in una speciale pentola circolare, che all'inizio veniva fabbricata con ceramica smaltata. Adesso utilizzata per cucinare le torte Bundt. In genere lo si mangia a colazione o durante la pausa caffè. Nuovo stampo della Birkmann dedicato al mondo della fattoria. Sono stampi in silicone alimentare, per cuocere in forno o congelare, materiale flessibile antiaderente per una rimozione facile dello stampo.Resistente alle alte e basse temperature da 240° a -60°. Stampo per realizzare una fattoria dettagliata in 3D. Le singole parti sono da assemblare per creare un edificio. Silicone sicuro per alimenti di ottima qualità in una confezione regalo, con ricetta. Lo stampo è utilizzabile sia in forno per cuocere che in frigo per congelare, resistente ad alte e basse temperature da 240° a -60°. Lavabile anche in lavastoviglie. Dimensioni:Ø 4.5-17 cm. Giannini - TUA coffee maker 6/3 cups Giannini presents the new coffee pot stainless steel Tua, available in versionie 6 cups can be used on induction hob. Tua is scheduled with manicatura base in white or black, always elegant and refined .. Since it is also now possible to customize the coffee pot with one of the new sets handle and knob, in the catalog. Made in Italy - Cut dough for ravioli rectangular star. 4.5 x 5.5 Cut dough for ravioli rectangular star. Handmade product made in Italy. Handle in wood and brass mold. Technical characteristics: size and seal the dough for your ravioli, with an ancient mechanism of suspension within the mold. Dimensions: 4.5 x 5.5cm. Weight: 250g. Made in Italy - Cut dough for ravioli square star cm 6 x 6 Cut dough for ravioli rectangular star. Handmade product made in Italy. Handle in wood and brass mold. Technical characteristics: size and seal the dough for your ravioli, with an ancient mechanism of suspension within the mold. Dimensions: 6 x 6 cm. Weight: 280g. Kit in plastica composto da 5 tagliapasta petalo. Cutter per realizzare una bellissima Rosa Canina. Decora. Lo stampo per La Rosa è un set di 5 tagliapasta in plastica alimentare ideali per la realizzazione dei petali della Rosa - uno dei tagliapasta più realistici in commercio. Dimensione petali: 4, 5, 6, 7 e 8 cm. Kit in plastica composto da 4 tagliapasta petalo e 3 tagliapasta foglie. Cutter per realizzare una bellissima Peonia, sia Petali che Foglie. Decora. Lo stampo per Peonia è un set di 7 tagliapasta in plastica alimentare ideali per la realizzazione dei petali e delle foglie della Peonia. Il completissimo kit è suddiviso in 4 tagliapasta per petali e 3 per le foglie, uno dei tagliapasta più realistici in commercio. Dimensione petali e foglie 8 cm. Modo d'uso: - preparare i pistilli da porre al centro della peonia e tagliare 5 petali per ogni tagliapasta-petalo; - inserire il filo di ferro nel petalo; - con l'attrezzo sfera, asottigliare ed arricciare il bordo dei petali; - lasciare asciugare i petali; - realizzare le foglie con gli appositi tagliapasta e lasciarle asciugare; - montare i petali della peonia,avvolgendoli attorno al grappolo di pistilli, partendo dal più piccolo al più grande. The new Jackson water bottle is very flexible in use thanks to the split body design: a flip top for drinking and a wide mouth for adding ice cubes. Also easy to clean. Jackson is leak-proof (unique sealing mechanism) and comes with a convenient carrying loop for easy transport. The durable and BPA-free TritanTM is a taste and odorless synthetic material that is also top-rack dishwasher safe. Features: - Leakproof - Wide opening ideal for ice cubes - Lid prevents spills and leaks between uses and on-the-go. Simply push the button to open. - Convenient carrying loop - One-handed drinking - Split-body design for ease of cleaning - Top-rack dishwasher safe At this moment, Contigo Jackson is at best price and is perfect for your activities. At trekkinn, you can find other products that complement into our Hydratation catalogue and particularly into our Bottles category. We have a variety of Bottles to suit your needs and to make you feel inspired to do more sport in your daily routine. SPACE POP MOLDS It's time to blast off with the Space Pops. To make the best pops in the galaxy, just use your favorite combination of fruit juice, yogurt, and add-ins. Transform your kitchen into Mission Control by simply pouring your ingredients into the detailed molds, inserting the reusable sticks, and Placing Them in your freezer. When your freshly-frozen treats are ready for takeoff, just pop the astronaut out of the mold-no rinsing required! Includes: 5 rocket molds, mold astronaut 1, 6 sticks with drip guards, mold base 1 Care: Hand Wash Capacity: About 1.2-2.2 fl. oz Dimensions: 7.7 "x 5.2" x 6.8 " Model: ZK124 BPA and phthalate free. When you have to make a trip, the most exciting moment is the wait. At the same , the preparation of a dish is the emotion before consuming it. The thrill of expectation is higher if you can dispose of kitchen utensils and accessories, as new cutting boards ZWILLING , which are the perfect backdrop to creativity along with the ingredients and ideas. The quality of the cutting boards is represented the harmony between the materials, ergonomics, performance and design. The new collections ZWILLING include different types of cutting boards in technical materials, and meet all requirements. Lightweight, multi-functionality and modernity are the characteristics of chopping wood fiber synthetic compact offering, along with the pleasant sensation of the natural material, the outstanding performance of most modern recyclable material. A fundamental help to cook with simplicity and lightness, with a good surface to cut, chop and fillet. These cutting boards are sensitive to the blades, but also exceptionally resistant and can be washed in a dishwasher. Are heat resistant up to 185 ° C and therefore can also be used as a trivet. The practical handle for hanging or to keep them more secure and manageable for all types of work. Made in black anthracite. Kyocera - Salt mill-pepper double adjustable - cm-25dbk Kyocera has expanded its collection of mills with the new double-mill ceramic, a grind of salt and pepper, a compact combination that stands out for its two mechanisms ceramic professional level. The mechanisms of Kyocera ceramic exceed the mechanisms metal base in terms of performance and durability. The thin and tapered symmetrical curves inward at the center, Rendeno the grinder easy to hold and visually appealing. A transparent window reveals the pepper grinder and a half of sea salt or spices in the other. There is a mechanism of ceramic tiles on each end, each closed by a cover black to keep clean and without shedding of ground spices base plate. This grinds two-in-one saves space on the table or work surface, providing superior performance for which they are known the millstones of Kyocera. Since the ceramic in grinders is chemically inert, it does not absorb flavors and will never alter the flavor of the ingredients during grinding. CM-25D BK is a millstone double adjustable Kyocera. Useful to grind sea salt, rock salt, peppercorns, oilseeds, etc., This grinding allows a grind from coarse to fine, has a ceramic mechanism that is non-corrosive, preserves the freshness and provides durability while the cap It maintains the dryness of the spices also in humid conditions. Acrylic reusable container. Not suitable for grinding nuts or foods bigger. Zoku - POLAR POP MOLDS Grab your parka and set sail for an arctic adventure with Zoku Polar Pops. Each set includes one very bundled up five friends and explore to discover along the way- a penguin, walrus, orca, seal, and polar bear. Your pops will feel right at home in Any freezer and can be made with your favorite juices, smoothies, or --other recipes. Each frosty pop Can Be Easily removed from the mold by pulling on the stick-no rinsing required! ncludes: 1 Set of 6 Sticks Molds and 6 with Drip Guards Care: Hand Wash Capacity: About 1.1-1.6 fl. ounces Each Dimensions: 9.5 "x 5.7" x 3.15 " Model: ZK125 BPA and phthalate free. Una nuova linea di stampi da cottura e surgelazione firmati PAVONIDEA®: “Fette in Casa” soddisfa il desiderio di personalizzare i propri dolci e salati decorandoli come più si preferisce. Ogni soggetto suggerisce due tipologie di decorazione: ogni fetta ha la stessa sagoma, ma ci si può sbizzarrire a decorare come più ci stimola l’immaginazione. Le alette danno sostegno e rigidità allo stampo e garantiscono risultati ottimali. Gli stampi sono in 100% silicone platinico e possono essere lavati tranquillamente in lavastoviglie. Solo al primo utilizzo si consiglia di imburrare leggermente lo stampo. REGISTERED DESIGN. Dim. 240 x 102 x 80 mm. Soft lunch bag compact and easy to store, designed to carry up to 2 containers. Can be carried by hand or stored inside of a larger bag. Height	18 cm Width	20 cm Profundo	12 cm Weight	0,1 kg. CHARACTER POPS Meet Prince the Frog, the sweetest guest at your table. This easy-to-remove individual pop comes with a stick with a built-in drip guard and little heart waiting to be discovered in the center of your pop. With eight collectible creatures in the Character Pop family, there’s one for every character in your own family. Includes: 1 Red mold base and 1 Reusable stick with drip guard Care: Hand Wash Capacity: About 1.4 fl. oz. Dimensions: 3.3” x 3.3” x 4.3” Model: ZK123 BPA and phthalate free. Brand: Benriner Model: No.120 Material: Body: ABS plastic (Heat resistant up to 70°C)(Anti-slip: Elastomer), Blade: Stainless steel, Hand Guard: Polypropylene plastic Colour: Off-white Product type: Mandolines Country of origin: Japan Dimensions (approx): 378×164×51 mm, Cutting surface width: 120 mm Item weight (approx): 510 g Shipping weight (approx): 650 g Key Features New and improved model. Thickness adjustment wheel to desired slice thickness. Adjustable from 0.5 mm to 9.0 mm thick. Specialised for the slicer function (Julienne blades are not compatible). Included hand guard holds food securely and protects fingers. Non-slip foot anchors the slicer on your work surface. Can be hooked over a bowl and slicing directly into a bowl. Use & Care Please contact us for the replacement parts. Background Benriner is a Japanese company founded in 1945. In 1940, The founder Uyuki Yamamoto first invented a daikon radish slicer with his own idea in Iwakuni city, Japan. Five years later, the company was established officially as “BENRINER” after the product name. The first BENRINER was the wooden made and mainly purchased by hotels or restaurants. Benriner Japanese Mandoline Slicer is very popular mandoline slicer that has very sharp blades. Nel gennaio del 1997 è nata l'azienda che nel 2000 ha creato la linea BE COOL firmata dal disegnatore tedesco Volker Huntertmark. I prodotti della linea BE COOL sono costruiti con materiali di qualità e disegni unici, utilizzati in molteplici occasioni (shopping , campeggio, tempo libero, wellness). BLOBBY, the practical kitchen aid, is a neat solution for perfectly separating the yolk from the white – as sure as eggs is eggs! Innovative and smart. for the perfect separation of egg yolk and egg white with practical suction effect silicone and plastic dishwasher-safe Using the BLOBBY egg yolk separator you are sure to separate the egg yolk from the white to perfection. Just break the egg, take the BLOBBY in your hand, press the comfortable-to-hold white silicone ball together and hold the transparent plastic element above the egg yolk. Then release your grip to let the ball draw in air. The egg yolk is sucked in and can be processed further. This innovative kitchen aid can be cleaned under running water or in the dishwasher. This egg stand can be used not only to place up to four eggs in boiling water and take them out quickly and easily but also to serve them when boiled. for boiling and serving four eggs of sizes S to XL adjustable stainless steel stand for pots of 12 cm diameter and bigger W 10.5 cm, D 10.5 cm, H 20 cm high-grade stainless steel / nylon dishwasher-safe Two adjustable stainless steel plates hold four eggs of sizes S to XL safely in the pot while boiling. When they are done, just take the eggs out, move the upper plate down onto the lower one, put the eggs back and serve them! The stylish combination of stainless steel and the black plastic of the ring-shaped handle makes the egg stand a practical and beautiful table accessory. The egg stand can be used in pots of 12 cm diameter and above. Pavoni - Slices in the house - Silicone heart cake mold A new line of PAVONIDEA® cooking and deep-free molds: "Fette in Casa" satisfies the desire to personalize your desserts and savories decorating them as you prefer. Each subject suggests two types of decoration: each slice has the same shape, but we can indulge in decorating as it stimulates us the most imagination. The fins give support and rigidity to the mold and guarantee optimal results. The molds are made of 100% platinum silicone and can be washed safely in the dishwasher. Only at the first use yes recommend lightly buttering the mold. REGISTERED DESIGN. Dim. 240 x 102 x 80 mm. Sigg - Metal Box Plus L Green Award-winning and featherweight – you just can’t beat it! Can’t you? Oh, but you can! We have completely redeveloped the classic SIGG Food Box, equipping it with some excellent new features. For example, a dishwasher-safe and microwaveable silicone insert as well as a separator made from polypropylene. And we’ve also taken another look at the already sophisticated closure system. Here’s the big box in the magnificent meadow green. Capacity: 1400 ml Size: 22.9 cm L x 14.5 cm W x 6 cm H.
Sigg - CYD Alu 1.0 L The Swiss original follows the customers’ choice of color. With the integrated grip, SIGG has launched a bottle on the market that offers more functionality and fun thanks to improved handling from the grip. Made from a single piece of high-quality aluminum, making it light and strong. It keeps a tight seal, even with carbonated drinks. The highly elastic interior coating is resistant against fruit acids, is tasteless and free from BPA and phthalates. The practical screw cap enables comfortable carrying with just one finger. Premetto che è un regalo e deve ancora essere utilizzato.